Name, age: Joshua Gall, 21 What corps are you in and what is your role this summer? Second year as Cadets tuba section leader. Give us your full drum corps/marching music background. This is my fourth year as a member of the Cadets and my second year as the Tuba section leader. I marched for five years as part of my high school marching band, serving as drum major and show designer for the last two years. How did you decide to be a member of your corps? Through becoming a fan of the activity I quickly drew on the respect that I felt that the Cadets exemplified through their performance on and off the field. What first attracted you to the drum corps activity? Seeing SCV's victory concert at a '98 show with a group of friends was incredible. After the show we went over to SCV's buses and one of the members came up to us and thanked us for coming out to the show. We told him we loved the show and the concert afterwards and he said he did drum corps to share his passion of music with people like us. I wanted to have that same effect on other people the way that SCV and that individual did that night. What advice would you give to young people who want to march?0 Shameless plug, but just do it! Research the basic information about the corps that interest you, like where they're located, what style of music they play, the average age, etc. Then try to find a few people that are associated with those corps like current marching members or staff and just ask them a few questions about their experiences with that and other corps as well. The last great film I saw: "The Shawshank Redemption," this movie gets better every time I see it. Jobs I have/have had: I am the owner of realMUSIC productions, a multimedia production company based in Richmond, Va.
Http://www.realmusicav.com . I also teach and design shows for various schools around the area. Three CDs I'd want on a deserted island: Incubus, "Morning View"; Incubus, "Science"; A Recent drum corps mix. My favorite TV show: No idea, Discovery Channel is great though. Favorite performers: Any member of a drum corps. How do you "blow off steam?" I try to keep "steam" out of my daily life. What has been your formative drum corps moment? Probably my first finals night. Certainly a time I won't forget. 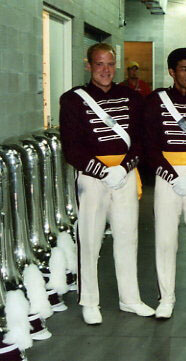 Best drum corps show ever: Cadets 2000. What are you most looking forward to about the summer? Having a great time with the guys in the section and seeing my family. Two of my other brothers are marching this year as well. My family does so much for me and when they come to shows it means so much to me to be allowed to share my thanks through performance. Best thing about being in a drum corps: Being in a drum corps. Worst thing about being in a drum corps: Leaving my business for the summer. During tour, the best part of the day is: Getting ready before the shows and hanging out with the tuba line. During tour, the worst part of the day is: WAKING UP. Favorite drum corps personality and why: Michael Cesario! No one can describe a drum corps like him. He has a larger vocabulary to describe a single drum corps than anyone else I've ever heard. What I want to be when I "grow up": I want to continue growing my business and expanding into new ventures. I also want to continue to teach and work with performing ensembles. I think everyone has had or will have a teacher that has had an amazing influence on them. To me, it's been my dad, who has been my teacher since 5th grade. Even though I'm out of school now, I still am learning so much from him. Describe what you think a typical DCI show will look in 2015. Everyone will step off with their right foot. I have no idea, but I'll be there to see it.